Sikhs In Fresno Worried After Recent Attacks Sikh-Americans in Fresno, Calif., are apprehensive in the wake of two recent attacks in the area on elderly Sikh men. 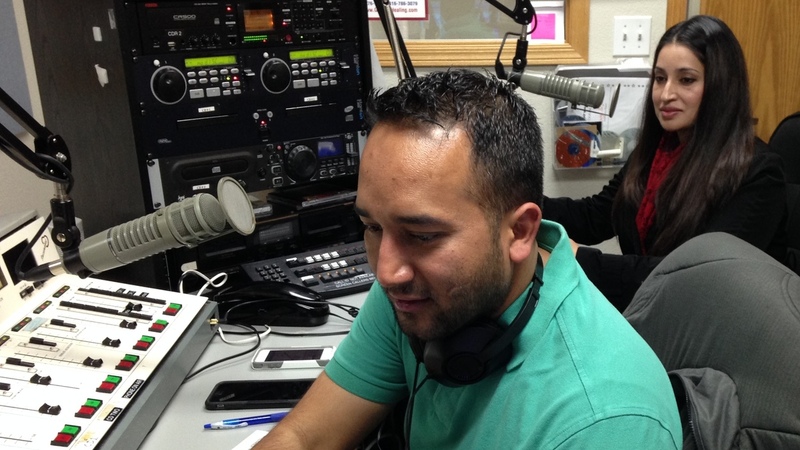 Gurdeep Shergill and his wife, Sonia, co-host a program on KBIF-AM for the 35,000 Sikh-Americans who live in Fresno. In Fresno, California — the heart of that state's agricultural community — police are looking for whoever attacked two elderly Sikh-American men. The incidents happened a week apart over the holidays. One man was fatally stabbed, another badly beaten. The attacks come amid reports of increased bullying and violence directed at Sikh-Americans around the country, apparently because they are mistaken for Muslims. The unprovoked and apparently unrelated attacks are a hot topic on KBIF-AM in Fresno, where Gurdeep Shergill and his wife, Sonia, co-host a program on Saturday mornings for the 35,000 Sikh-Americans who live in Fresno. "This morning I was talking about the hate crime, I was giving them the definition, what is hate crime, why they happen," Gurdeep Shergill says. The subject of hate crimes is ripe in the community. The day after Christmas, a 68-year-old farmworker, Amrik Singh Bal, was attacked and beaten by two white men as he waited to be picked up for work. Bal was wearing a turban at the time. Then on New Year's Day, another 68-year-old man, Gurcharan Singh Gill, was fatally stabbed in the liquor store where he worked. In that attack, Gill was not wearing a turban indicating he was Sikh, said Fresno Police Chief Jerry Dyer. "But we are looking at this as a potential hate crime as well," Dyer says. Dyer asked the FBI to help with their investigation. He said Sikhs have lived in Fresno for more than a century. As Dyer talked about what's happened in his hometown, his eyes became red and moist. "I was at a community meeting last week with a number of those individuals, and you could just sense the fear," he says. "Are they being targeted as a result of being mistaken as a terrorist or extremist? Is it because of what occurred in San Bernardino or Paris? And those are all legitimate concerns." National advocacy groups are concerned as well. A spokesman for the Sikh Coalition, Mark Reading-Smith, says since the San Bernardino massacre last month, it's received three times as many reports of hate backlash than in previous years. The attacks are also unsettling to people attending Fresno gurdwaras — Sikh houses of worship. One man, who identified himself as "Mr. Singh," said he won't stay at home or be intimidated from wearing a turban in public. "Anytime, anytime something could happen" says Singh as he shrugs his shoulders. He says Americans need to be better educated on the differences between Sikhs and Muslims. But would the attacks on Sikhs stop if people realized they aren't Muslim? That question troubles many in the Sikh community, especially younger people. "The problem in that kind of narrative is it actually implicitly says there is a proper victim," says Nandeep Singh, the executive director of the Jakara Movement, a youth-oriented nonprofit based in Fresno. "When we see rising Islamophobia, are we to back away from our fellow Americans, or to embrace them that much tighter?" he says. "To say that attacks against all is wrong. It really isn't attacks against Sikhs that are wrong, but it's really attacks against anybody." Singh expects attacks on Sikhs could continue. But he also sees an opportunity for those in the Sikh community not just to educate people about who they are — but remind them they are Americans too. Radio host Gurdeep Shergill agrees. "I tell my audience that we are Americans," he says. "And if we can't feel safe in America, there's no other place in the world where we can feel safe."